When it was completed in 1960, the gleaming, full-block tower occupying the block between Park and Madison avenues and 47th and 48th streets was the tallest building erected in New York since 1933 and the tallest building on Park Avenue. 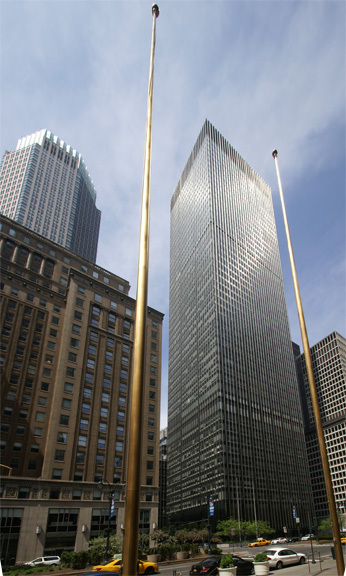 Two years before, the Seagram Building at 375 Park Avenue between 52nd and 53rd Streets was completed, a shorter and darker but extremely elegant tower that was quickly recognized as a masterpiece of modern architecture that ushered in an era of plazas. It had been designed by Ludwig Mies van der Rohe, Philip Johnson and Kahn Jacobs. It and two buildings completed in 1952, the green Lever House across the avenue and one block north designed by Gordon Bunshaft of Skidmore, Owings & Merrill and the United Nations Secretariat Building designed by an international term headed by Wallace K. Harrison, made New York City the center of modern architecture. This tower, designed by Gordon Bunshaft and Natalie de Blois of Skidmore, Owing & Merrill, raised the high-rise stakes considerably with its many, thin protruding stainless-steel mullions with black spandrels giving it a glistening but slightly menacing presence. One could argue that the black spandrels detract from the building's "magnificence and that silvery spandrels would have given the project "a lighter air" and significantly lessen its monumentality. It is that monumentality, however, that is impressive along with its wonderful proportions and many "little" design touches. "The work of Mies van der Rohe in general and the Seagram Building in particular had an extraordinary impact on office-building design during the 1960s. The architecture of Skidmore, Owings & Merrill, whose approach to Modernism had tended to eclectic in the 1950s, shifted dramatically toward Mies after the pubication of the early Seagram studies. Regretfully, few of SOM's Miesian office towers had the tectonic force or intellectual clarity of Seagram's, and the increasingly successful firm began to crank out more and more diluted versions of the original. "SOM"s first Seagram-style building, and in some ways the best interpretation of it, was the Union Carbide Building (1955-60) at 270 Park Avenue....Plans for the building were first announced in August 1955. The two-acre, full-block site...was that of the former Hotel Marguery. A decade earlier, William Zeckendorf had proposed a project for that same site that was rumored to be a complex of officers 'tailor-built to the requirements of three big-league customers,' with separate entrances for major corporate tenants and a department store facing Madison Avenue....In the middle of the block, a 300-foot-high tower would rise without a setback from a fifteeen-story base that would cover the entire site To provide unbroken floor space in the tower, the elevator core would be planed to one side an dnot i the center. Zeckendorf's plan never materialized, however. "While Seagram's inspired a demand for zoning reform that would encourage the creation of plazas and would eliminate the ziggurat-type building, it was the far more 'realistic' Union Carbide that actually influenced the proposed law, which was being considered as the building was being finished....Union Carbide's impression of top-heavy bulk was reinforced by the shallowness of its plaza and a low, thirty-eight-foot-deep arcade along Park Avenue. Such bulk was permitted under the zoning because the building was set back along three of its four property lines (it held to the property line on Madison Avenue) and also provided a sixty-foot-wide street-level pedestrian arcade extending Vanderbilt Avenue northward through the mid-block. The arcade led to a small glazed lobby along Park Avenue and escalators that took visitors to the building's principal lobby, located one level above. This piano nobile arrangement was devised to that the elevator pits would penetrate as little as possible below street level in order to keep clear of the trains below....The twenty-five-foot-high raised lobby was used as an exhibition hall, although its remoteness from the street and the seemingly private quality of the space failed to attract significant numbers of the general public." Union Carbide eventually relocated to the suburbs and JP Morgan took over the building. According to an February 22, 2018 article by Charles Bagli in The New York Times, the 52-story building originally provided space for about 3,500 workers but over years later was renovated to provide space for about 6,000. The article reported that JP Morgan and the city had announced plans to demolish the tower and replace it with a 70-story tower with 2.5 million square feet that could accommodate about 15,000 workers, a dramatic reflection of the dwindling amount of space many companies are now willing to provide their workers. The existing building at 270 Park Avenue is notable for its double-height lobby on its second floor that for many years had very attractive bright red walls. The article said that the new tower would "soar are much as 500 feet higher than the existing" building although it provided no details on its configuration other than to say the bank was "expected to buy unused development rights from nearby buildings, generating more than $40 million for public improvements to the streets, pedestrian plazas and sidewalks in the neighborhood under" the city's recently enacted and controversial midtown east zoning. Such a plan would make the new tower about 1,200-feet tall, a few hundred feet shorter than what is being built on the full block just to the east of Grand Central Terminal where Kohn Pederson Fox has designed a 1,400-foot-high tower with a rakish base and a setback tower that will be several hundred feet tower than the Chrysler Building. The city plans to make a pedestrian plaza out of Vanderbilt Avenue and allegedly will get about $200 million for area improvements from the tower's developer, S.I. Green. 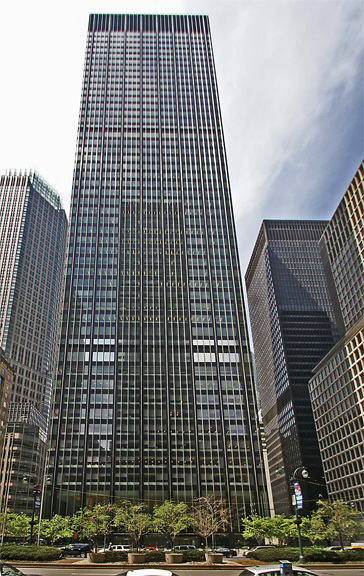 After protests that the Midtown East area, once the city's most prestigious and expensive office district, might lose several important buildings worthy of being preserved, the city's Landmarks Preservation Commission decided to designate a dozen as landmarks but specifically and incredibly declined to designate the JP Morgan tower. The De Blasio administration has demonstrated in its push this zoning and for the Hudson Yards that it has no aesthetic sensitivity and no clue to basic principle of urban plannning. A February 21, 2018 article by Amy Plitt at ny.curbed.com noted that in a statement a spokesperson for the Landmarks Preservation Commission that "prior to the rezoning, the Commission evaluated many buildings in the district including this one," adding that "as a result, we prioritzed and designated 12 iconic buildings as individual landmarks, but JPMorganChase building was not among them." "LPC found that other buildings from this era and architect had already been represented by great landmarks, including the Manufacturers Trust Company building in East Midtown and the former One Chase Manhattan Plaza in lower Manhattan. The 12 designations in East Midtown brought the number of designated individual landmarks to 50 that include International style masterpieces of this era such as the Seagram Building and Lever House," the article continued. Justin Davidson, the excellent architecture critic for New York Magazine, wrote that "to demolish one of the peaks of modernist architecture in the name of modernity is obscene, a sign that you consider your city disposable." Paul Goldberger, a former architecture critic for The New York Times and The New Yorker Magazine, commented on the Internet that he was "speechless: under the radar, JPMorganChase develops a plan to demolish SOM's UnionCarbide, a deserving 1960's landmark, and build new," adding that "Most postwar ParkAve is junk, and they want to demolish one of its greatest buildings bc new zoning allows bigger." Mayor de Blasio and his Landmarks Preservation Commision and the City Planning Commission are barbarians! They don't question statements that some major office buildings, such as 270 Park Avenue, cannot be adapted for contemporary office use. None of the major published reports have itemized what's wrong with them. How can anyone justify Hudson Yards as a premier office location when it is a very great walking distance from Fifth Avenue, Park Avenue and even Broadway and is not a scenic hike? It is remarkable how many major well-known companies have decided to relocate to it but that only is testament to the stupidity of their CEOs and the brilliance of the marketing efforts of the Related Companies. Demolition of 270 Park Avenue is an unconscionable squandering of money, a defacement of the urban high-rise environment and an inexcusable environmental act. Why not built a 1,200-foot-high office tower in the Bronx or Staten Island, or at least replace one of the much less distinguished and attractive office towers right across Park Avenue? Why not provide workers with a little workspace rather than stuffing them into space that was unthinkable just a couple of decades ago? Fairly recently, JPMorganChase abandoned its downtown skyscraper at One Chase Manhattan Plaza, but its new owners are not demolishing it or its very grand plaza. 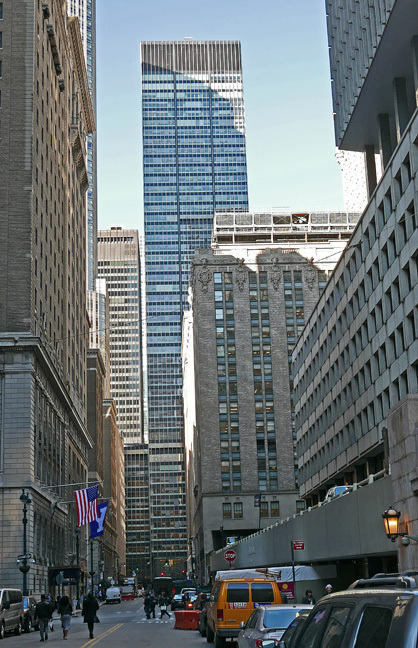 270 Park Avenue is a handsomer tower although its plazas cannot compare with One Chase Manhattan Plaza. Clearly, the heads of JPMorganChase do not have the artistic chops of David Rockefeller, who led the bank in creating One Chase Manhattan Plaza and can only be judged now as philistines. Hopefully, many people will withdraw their deposits in protest of this urban sacrilege!